Gov. Imee Marcos said during a follow-up interview after the July 25 hearing at the Congress that her mother, former first lady Imelda Marcos was alarmed that she withdraws her alleged accusation that the LP bribes some congressmen to make sure of her detention. But if her retraction can set them all free, then she was happy to do just that. 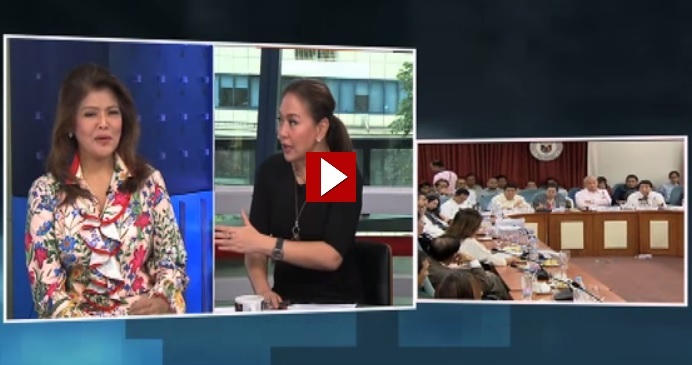 [VIDEO]: THE NORTH REMEMBERS: Ilocos Norte Governor Imee Marcos on Wednesday referenced the popular HBO series Game of Thrones to describe her desire to forge peace with her political rival, Ilocos Norte Representative and House Majority Leader Rodolfo Fariñas. Gov. Marcos humorously talks about the gossips in the Congress. Referring to the alleged 100 M LP bribe report she received, she explains that when it comes from a woman, it’s considered as a mere gossip. However, if it comes from a man, that could be some kind of an intelligence report. Therefore, it is indicated here that it is not just a mere speculation but a warning. Thus the reason why she can’t divulge the source to protect her. She really has the wisdom to decide on the right choice. Since the Ilocos is already released, it is understood that there are no cases filed against them. However, the case at the Supreme Court against the Congress on the writ of Amparo for threatening their liberty which is a grave of abuse is still pending. Marcos said that no one is questioning the power of the Congress but they have to follow in aid of the Constitution and the mandate of its own rules. She said that this is where she can contribute if she runs for a seat in the Senate for 2019. The President is aware of the Ilocos Norte’s struggle with the Congress. However, Gov. Marcos thinks that he has a lot on his plate with the conflict in Marawi and other problems of the country. She does not want to bother him anymore with an additional worry. Therefore, she manages to exhaust all legal means possible and so far, it is successful. Another hearing is coming up in August but since the Ilocos 6 is already free, this is just a matter of going through the legal proceedings now.